One reason that hardwood flooring is so loved and popular is its durability and lifespan. A quality hardwood floor can last a century or more, but not without the proper care. Some of today’s common floor care practices will quickly bring damage to a hardwood floor. Understanding what can prematurely damage hardwoods is very important to keeping your hardwoods in top shape so that they last that century or more they are expected to. 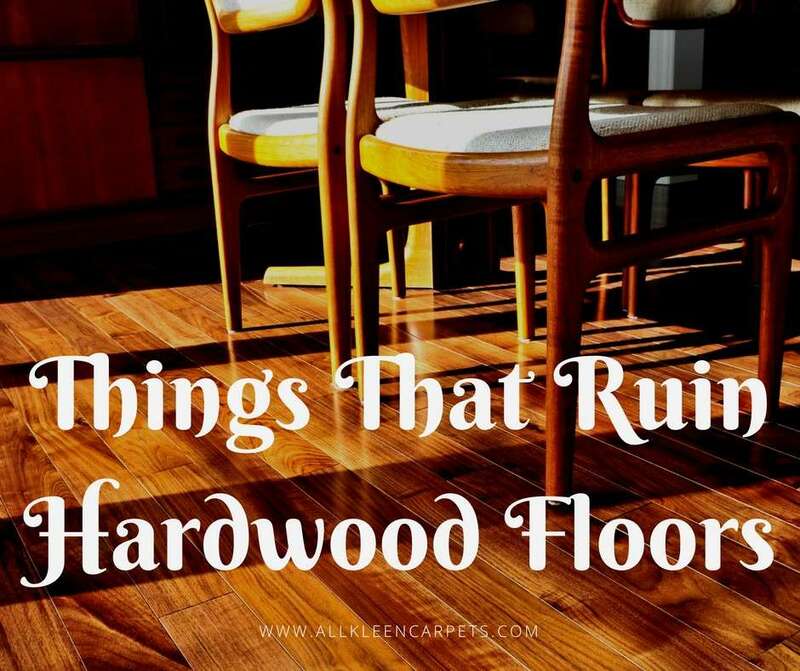 Here are some things you DON’T want to do when caring for hardwood floors. Water is one of wood’s biggest foes. The cellular structure of wood responds immediately when coming in contact with water. When wood comes in contact with water, swelling and decay can result. The surface of a hardwood floor is sealed so this is not an issue, but you do not want water coming in contact with the untreated sides and bottoms of the floorboards. Using way too much moisture when cleaning a hardwood floor is a no-no. At the very most when you mop a hardwood floor you should be using a damp mop that is almost dry and only use cleaners made just for hardwood in small amounts. Some flooring experts will encourage not mopping at all and just daily cleaning with a dust mop and weekly vacuuming with a special hardwood floor vacuum. There are many ways that liquid comes in contact with hardwood, not just with mopping. Things get spilled, appliances leak, dog drips water, shoes bring in water and mud from a rainy day, etc. The problem is not an immediate emergency on the surface finish, but it is a concern for seeping into the seams and reaching into unfinished areas. You want to be especially careful if you have hardwood floors that were pre-finished before installation. Liquids can easily get between floorboards because there is no finish in the seams. If you have floors that were laid and then finish was applied you have a bit more time because the seams have been sealed with a finish. We are not necessarily talking about the sharp objects that come to mind right away like say knives and scissors. While these items can cause damage to wood floors they are less frequently in contact with your floor than say animal nails/claws, high heel shoes, cleats, and furniture feet. These items can cause a lot of scratching and denting to wood floors. Try to keep damaging shoes off of hardwoods, put felt pads on the bottom of furniture, and make sure pet nails stay trimmed just enough not to touch the floor. The use of area rugs and animal bedding also help. Dirt and debris are your floor’s number one enemy. These items act like fine sandpaper and over time begin to wear away at your beautiful floors. Ideally, you should be giving your floors a quick, but proper sweeping or dry mopping once a day, a vacuuming once a week, nearly dry mopping about twice a month, and deep professional cleaning once a year. The right care of hardwood floors is so important to keep them beautiful and last a lifetime. Once a year have a professional come in to give the floors a deep clean and get all the debris that settles between the boards into the seams. For hardwood cleaning in Bothell you can trust make an appointment online with All Kleen.